A misty morning turned this Chesapeake Bay wedding shoot into something out of a dream! 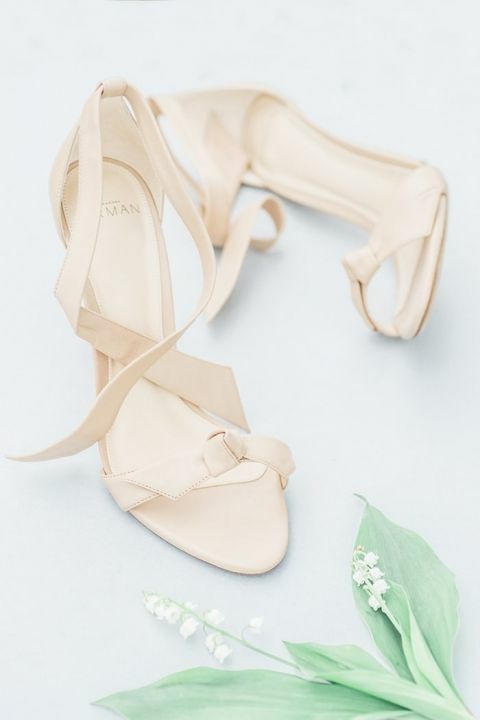 Manda Weaver Photography and Cristina Calvert Signature envisioned beautifully classic wedding inspiration with a twist, from the brunch menu to the understated preppy style to the English-inspired floral details! Prepare to be enchanted with this windswept coastal wedding day on Chesapeake Bay! Luminous morning mist rolling in off the Chesapeake Bay set the ethereal tone for this utterly enchanting morning wedding! A brunch menu of pastries and petite blueberry pancakes was the perfect way to start the morning, along with plenty of frothy champagne! Cristina Calvert Signature styled the bride’s look with the perfect balance of English elegance and Maryland prep, opting for a boatneck top and three quarter length sleeves to ward off the sea breeze. 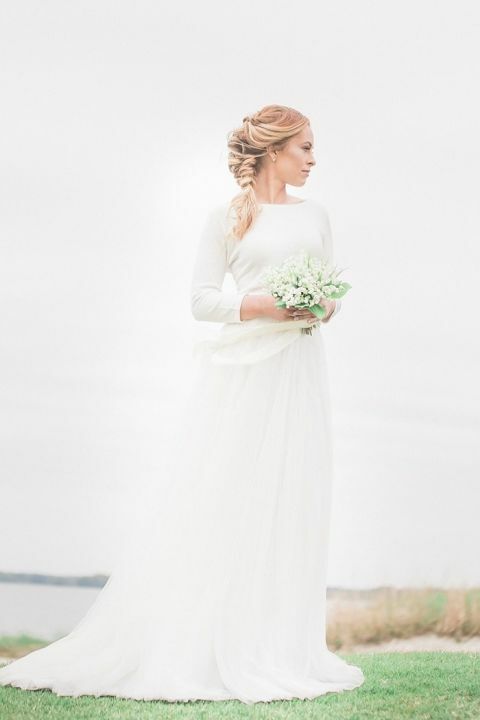 The bridal separates paired a cashmere wrap top with a soft tulle skirt. The flirty open back and romantic braided hairstyle added a touch of modern romance to the classic bridal look, accented with a delicate lily of the valley bouquet inspired by Kate Middleton’s wedding! 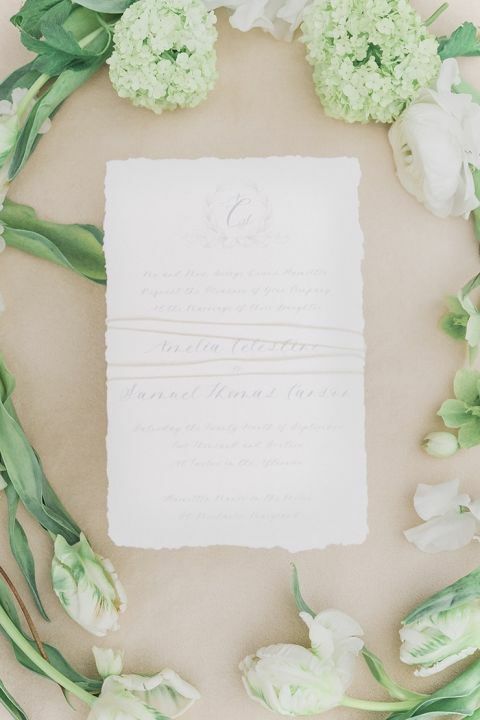 English wedding inspiration continued into the lush green and white floral arrangements by Petals and Promises, pairing cottage garden blooms like hellebore, roses, and ranunculus with quintessentially Southern touches like flowering dogwood. 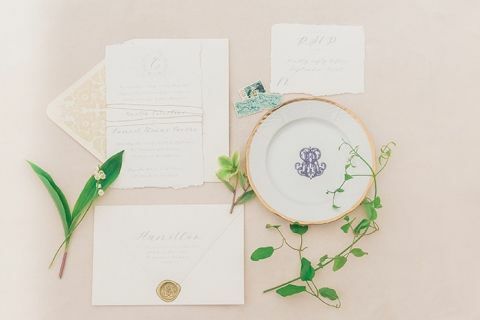 The spring greenery added a natural touch to the neutral table decor, with cream velvet table linens paired with custom monogrammed china plates and flowers in vintage crystal compotes. A decadent mini cake adorned each place setting, with a subtle ruffled finish and sugar flower topper!